Do you want to start a profitable farming business in Bangladesh with a small investment? In today’s days, broiler poultry farming business in Bangladesh becomes one of the most important occupations. As there is a tremendous increase in the population of the country, the demand for food is increasing. That’s why broiler poultry farm is necessary to burn the hunger of such a great population. An 80% of our population depends on the non-vegetarian food in Bangladesh. So, its great opportunities arose for the people who want to take a step in the food industry due to these aspects. And a 50% of meat is occupied by broiler chicken among all non-vegetarian food items. Moreover, demand for broiler meat is also increasing as the population is increasing. And those who want to open broiler poultry farm is a great opportunity for them. 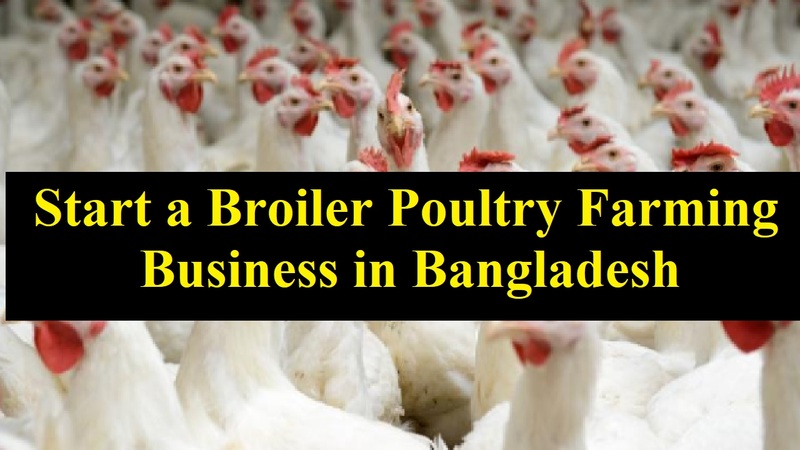 The broiler poultry farming business has become an unparalleled platform for a quick profit, the generation of local employment, and the production of cheaper animal proteins since the beginning of 21st century in Bangladesh. also, the poultry industry in Bangladesh may become multi-dimensional and more stable in the near future as it establishes sufficient backward and forward linkages to input and output supplies according to a critical analysis. As the broiler poultry farming business costs are coming down in spite of rising feed and management costs, it’s catching up very fast in Bangladesh. However, it’s hovering close to the production cost when the price of grown-up broilers. Because consumers are looking at the health of the bird and other attributes like dressing percentage and muscle growth, they are looking at the quality of the reared broiler. So, the farming has to be done meticulously and scientifically under the circumstances. Now, let’s know how to start a broiler poultry farming business in Bangladesh. Although identifying your market is part of your business plan, you’ll need more information than just that to create a guide for your business as you move along toward its creation. Another most essential thing for your broiler poultry farming business is capital and that must include in the plan. Specifically, how much you need and how much you have in your hand along with the sources of potential shortages. What equipment you’ll need for them: fencing, housing, waterers, and feeders. Learn more – 20 easy steps to write an effective business plan. It’s necessary for you to examine some characteristic of the land such as region, weather, climate, infrastructure and all before choosing land for your broiler poultry farming business. If you want to get great profit from broiler poultry farm and maintaining good health of flocks then you should have a location with the suitable condition. So, the suitable region becomes an important aspect to open a broiler poultry farm. But, you don’t have to go anywhere to find those characteristics. Simply continue reading this guide and it will lead you to know all the necessary things to start your farm. It’s very important for successful broiler poultry farming business selecting high-quality productive breeds. As there are numerous local and foreign high-quality poultry breeds available in India, choose proper breeds according to your desired production. You have to go with highly meat productive broiler poultry breeds for commercial meat production business. Selecting a suitable land is the main and foremost important thing for broiler poultry farming business. Also, this is not only the most expensive but vital part of this business as well. You should select the land area according to how much birds you’ll raise on your farm. Also read Best Tips for poultry farm housing.